With obesity on the rise it is time for you to review eating habits. What is on your plate? Does it look or seem healthy? If you are considering a lifestyle change that aims to achieve overall health and fitness, you will have to make changes to your diet. A balance between health, fitness and nutrition is what will give you a long and healthy life. Nutrition is not about limiting food, in fact, it is about consuming a balanced meal with foods that you enjoy, but in moderation. Eating healthy is about natural and unprocessed foods. You may think putting together a nutritional and healthy diet seems like a daunting task. However it can be quite simple. Incorporate starchy carbohydrates as part of your daily diet. 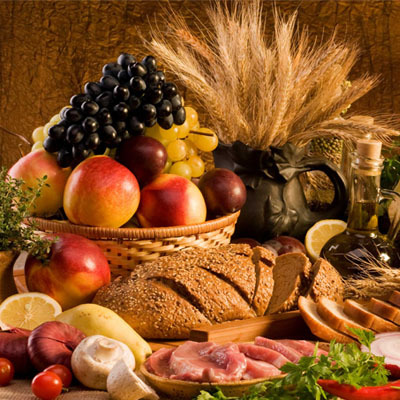 Starchy carbohydrates include the likes of potatoes, cereals, rice, pasta and bread. Eating potatoes with the skin or wholegrain varieties will help your stomach feel full as these foods contain fiber. You should eat more starchy foods and include one of these in your daily meal. No, starchy foods are not fattening but in fact contain fewer calories. What you need to watch out for is what you add to these foods. For example, do you fry the potatoes in oil, make creamy sauce with pasta or add oil on chips? Eat a lot of vegetables and fruits. Yes, you may have heard this phrase a countless number of times but it still seems like people are not prone to consuming their daily fruits and vegetables. Even a glass of fruit juice or smoothie will count as a dish of vegetables or cup of fruit. Fish contains Omega 3 fatty acids and is an excellent source of vitamins, protein and minerals. Incorporate 2 portions of fish, one of it being oily fish. Oily fish helps prevent heart disease. You can include fish in your daily diet in the form of mackerel, salmon, herring, trout, sardines and fresh tuna. Non oily fish come in the form of plaice, haddock, cod, coley, skate and hake. Cut down on sugar and saturated fat. Yes, everyone needs some fat in their diet. But, there is saturated fat and unsaturated fat. Saturated fat can increase the risk of cholesterol leading to heart disease in millions of people worldwide. Unsaturated fat, on the other hand, are contained in foods like oily fish, vegetable oils and avocados. Foods with saturated fats you should avoid include cakes, hard cheese, biscuits, cream, sausages, lard, pies and butter. Sugary foods are another no-no. If consumed often, sugary foods can lead you to gain weight. Instead, cut down on alcoholic drinks, sugary fizzy drinks, sugary cereals, biscuits, pastries and cakes.